A new addition in the rapidly expanding midsize crossover market, the 2009 Chevrolet Traverse is the latest SUV built on GM's Lambda platform. It will join the Buick Enclave, GMC Acadia, and Saturn Outlook, but the Traverse will be differentiated by bold new styling Chevy has introduced within the last few years. The Lambda platform has brought GM considerable sales success with previous incarnations, largely due to a fine blend of road manners, fresh styling, and flexible utility. Chevy will offer the Traverse in both front- and all-wheel-drive configurations, with both receiving power from a six-speed automatic transmission. Chevy's direct-injection version of GM's 3.6-liter V6 engine will deliver 281 horsepower with a single exhaust, or 286 with a dual-exhaust setup. The new Traverse is also expected to boast better fuel economy than its older GM siblings, thanks to direct injection technology. Outside, the Traverse has a profile similar to Buick's Enclave, while incorporating several of the current Chevy Malibu's styling cues into the overall design scheme. In the cabin, Chevy's new crossover offers a refined and well-organized environment, with seating for seven or eight passengers distributed through three rows of seats. A two-tone color scheme is highlighted by quality interior materials and numerous fine trim details. Notable options include a rear-seat entertainment system with second-row controls, a navigation system, and a rear-view camera. What's your take on the 2009 Chevrolet Traverse? Users ranked 2009 Chevrolet Traverse against other cars which they drove/owned. Each ranking was based on 9 categories. Here is the summary of top rankings. 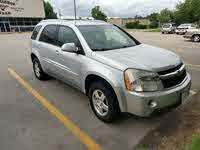 Have you driven a 2009 Chevrolet Traverse? My check engine came on after I put gas in my vehicle could it be the gas?